I remember one of the sons, Louis, serving in the shop. I was rarely in that café, only if I had any cash left after my visit to the nearby newspaper shop of Ross and Park at no.17 where I had spent a long time choosing my scraps and usually had spent all my cash. Louis was later to appear in the new Lido Fish Restaurant which appeared at 7 West Clyde Street. Joseph Antonelli Senior, the proprietor, served at his Ciro Café at 4 West Clyde Street. The family lived above the shop at 6 West Clyde Street. 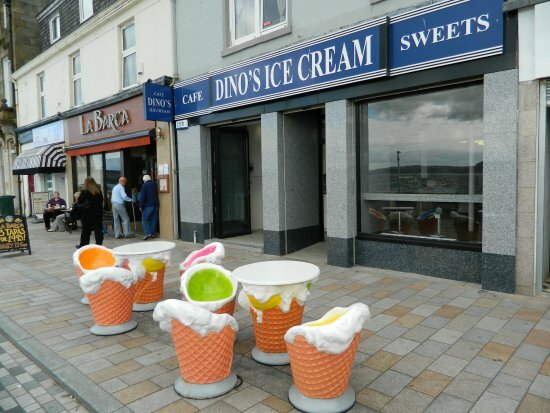 This was the ice cream shop I frequented most, in spite of the owner being rather intimidating. The ice cream cones were the biggest. I only realised years later that I was given special treatment. At 11 West Clyde Street was the Queen’s Café, proprietors, Joseph Antonelli and Son. Joseph Junior ran this café. It was more spacious than the other establishments and much more modern. I would have loved to sit at one of the fancy tables and be served one of the exotic concoctions which were advertised in the coloured posters which adorned the walls of the café . However, the opportunity never arrived. I remember the day Joseph Junior introduced his new wife to my family. I thought she looked like a film star. Tall and elegant, but with her hair in a bun! I thought only Grandmothers had buns. In spite of the offending hair style I thought that she was beautiful. I found that she was also kind and had time talk to child customers. Joseph and his wife engaged in conversation with their customers. As the youngest by far in the family I was often forgotten. But playing nearby I overheard a lot of the conversation. I remember hearing about Mrs Joseph’s family. I cannot remember if it was Rothesay or Dunoon she came from. She came from a similar business background, somewhere down the Clyde. I loved to hear about Italy. Many of the families spent weeks in there in winter. When the family had visiting children from Italy I was invited to play with them. I loved it when the café was closed and we were allowed to amuse ourselves in what seemed a great space. I also loved the sound of the Italian language. It took me a while to realise that they were not arguing all the time. I changed my allegiance from the Ciro to the Queen’s since the cones were the same size. Further along the street at 19 West Clyde Street was the King’s Café, proprietor E.Rossi. I played with two of the children, Dora who was older than me and Eric who was younger. Eric was sent to Italy to be educated and I never saw him again. The children of the area met on the sandy shore — which was kept rubbish free and clean — and at the back of the Old Granary Restaurant. We enjoyed meeting children we did not have a chance to meet at school. Many lasting friendships were formed then. Each café had its speciality and Mrs Rossi’s was Hot Peas. The peas were cooked in vinegar and spices, and it was not unusual to see people walking along Clyde Street holding a jug. We knew where they were going. Across Colquhoun Street at no.31 West Clyde Street was the Radio Café owned by John Arioni and John Baldi. This was the favourite meeting place of the older youths of the town. We did not have the Teenage Years it was straight to work from school. I remember the excitement radiated by the arrival at school of an Italian boy joining 5th year. We were still at an age when we regarded boys as pests but I do remember that his name was Dino. The cafe thereafter was known as Dino's (pictured above as it is today). I do not know when that became official. It is still Dino's today. The attraction was the Juke Box with its flashing, coloured lights belting out the latest music. A list of the contents and a slot for the money enabled the lads to play their favourite tunes. There was a staircase at one side of the café leading to an upper area which was their favourite meeting place. However I was never in that café as a child. At 56-58 West Clyde Street was the West End Café owned by F.G.Arioni — a later owner was called Big John by his clientele of lads. This was the meeting place of the youth of the area. Amedio Rossi was the owner of the Augusta Lodge Café at 83 West Clyde Street. The name has survived from the early days of the town. This was the estate of Lady Augusta Clavering who lived there in 1804. This café was popular with young couples on a date. After an evening enjoying a film at La Scala or the Tower cinema the perfect end to the evening was a romantic walk along the esplanade under the colourful fairy-lights, which on a moonlight night were reflected on the water. The Augusta Lodge was the ideal place to make for to enjoy a chat with a coffee or hot orange drink. I was never in the café as a child but I did enjoy such occasions in my time. Although a war had intervened, some things never change. My Dad had a workshop, among others, at the back of the Ciro and Lido cafes. There was D.S.Maclachlan the baker’s garage where the vans were repaired and washed. Mr Machlachlan had two bakers shops and two restaurants at one time in the town, also businesses in Rhu and Garelochhead. Next door Mr McKie recharged his batteries for his radio shop. Further up the yard beyond a large gate which was often opened we visited the two bakeries. We preferred the one where the bread was baked. We had to go down several steps into what we likened to a cave. It was darker and colder than the other building. We saw the dough at different stages of the exercise. Opposite was the brick-built cake bakery. We were allowed to stand a distance away to watch the confectioner ice a wedding cake. Young as we were we were impressed by the skill needed to form perfect pink roses to adorn the cake, a work of art indeed. Next was a visit to O.B.Ross’s shoe repair shop. I do not know the name of the cobbler who entertained us, but we enjoyed his skill and our visit. I reflect now on the patience of these busy men to our uninvited visits and think how lucky we were to have known them. They talked to us and with good nature answered the questions that were fired at them. There were many such workshops at the back of shops all over town as well as front shops. The gable wall of the building on Clyde Street was ideal for stotting a ball against the wall accompanied by body contortions before catching it again while singing the rhymes which seemed to be part of most of our games. In the season peever was the main game until by some mysterious communication it changed to whip and peerie time, then skipping came into play. Opposite the gable end was Mrs Antonelli’s kitchen window. This was where I met my Italian friend. When I played alone, which was most of the time, she chatted to me. I loved to hear her talk. English sounded much more interesting with an Italian accent. I did not understand half of what she said, but I loved the rhythm of her voice. I still recall the peace and companionship of those lovely days with Mrs Antonelli as she chatted to me in her lovely accent. The other Italian businesses were Fish Supper Restaurants. They also sold hot pies and sausage suppers and, importantly, pickled onions. At 7-13 Colquhoun Street Giovanni’s Jaconelli’s Fish shop and Restaurant was a large establishment which incorporated an ice cream shop. It was an extremely busy business. There may have been other such businesses in the town but I did not know of them. Can you imagine the horror of hearing in 1939 when war broke out that all our Italian neighbours and friends were to be interned for the duration because they were ‘alien agents’? Suddenly they were different as far as the country was concerned, although not to us. This was only one of the many sad, unexpected results of war that we somehow had to cope with. Once I was in uniform and an LACW Wireless Operator, it was only too obvious to me just how devastating the situation was as the war spread to Italy and the dreadful consequences of that awful Italian war zone. I had a relation serving in that campaign just as my Italian friends had, but on the opposing side. After I was demobbed I realised that the old order had changed and the town would never be the same again. However, one thing I was very glad to see was that the Italian families were back in town, although sadly not my friends. I treasure the memories of the community that once was Helensburgh — a town that was proud of it history and celebrated it. Socially divided, yes, but within our own communities there was a close-knit bond.